Its been a while since I’ve lead a club ride, so I thought it was about time I stood up to the plate and organised one. I decided that the Ruffy Produce Store would be a great destination for a summer ride. The weather forecast on the day was warm and sunny with a top temperature in the high twenties. Perfect riding weather. While David P went to South Yarra to collect any riders there, I made my way from Marysville to the second pick up point at Liliydale to lead the ride. By 10.30am we had a group of 16 bikes and it was great to see some old familiar faces I haven’t seen for some time, and to check out a few new bikes in the club, in particular Peter H’s new BMW R1200RS. You know your getting a bit older when you buy yourself a new beemer (watch this space, someone else in the club just bought a BMW too). Time to head off as we watched just about every bike and car club in Melbourne pass through Lilydale, it was crazy. We followed the Maroondah Hwy to Healesville, and then up the black spur. I knew it was going to be slow through this section because of all the traffic but didn’t expect to be stuck behind 60 Mercedes Benzs doing 50kmh as they headed to their club lunch at the Eildon Boat Club. They all turned off at Faggerty, oops sorry I mean Taggerty, as we continued onto Alexandra. 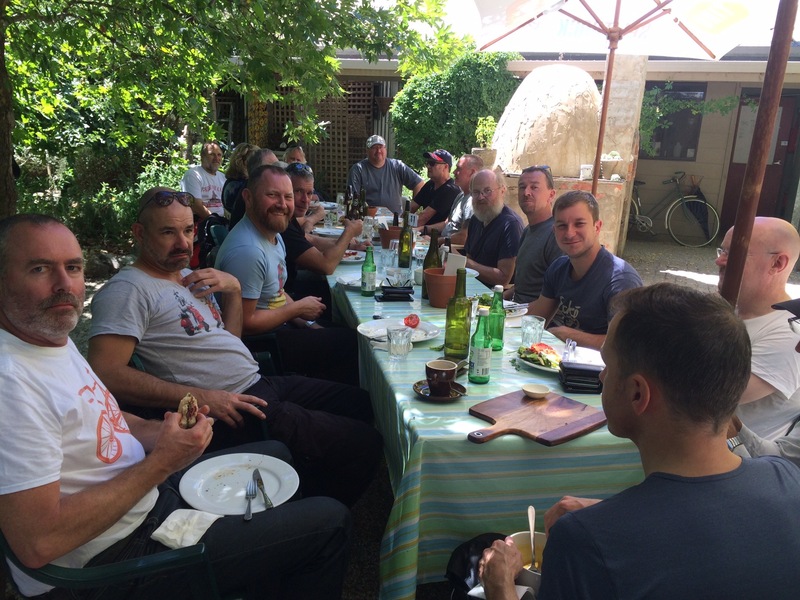 At Acheron we parted from the highway and went on the back roads through Breakaway and over the Goulburn River into Alex for a quick re-group and fuel top up as the next fuel was 150km away. After refuelling we set off again towards Yarck where we turned off the highway again to head through Gobur before reaching Ruffy for lunch. The road passed through rolling green river pains at the foot of the Black Range and soon we started climbing the narrow twisting road up the range to the plateau and onto lunch. There’s nothing in Ruffy these days apart from the closed down school and our destination, The Ruffy Produce Store. People travel from Albury and Melbourne to dine at this rustic old building. The food is simple, serving whatever is in season, and outside dining under the trees in the beautiful gardens is just magic. We had a long table set up under the shade of a mature tree which was a good thing as by now it was really starting to warm up. 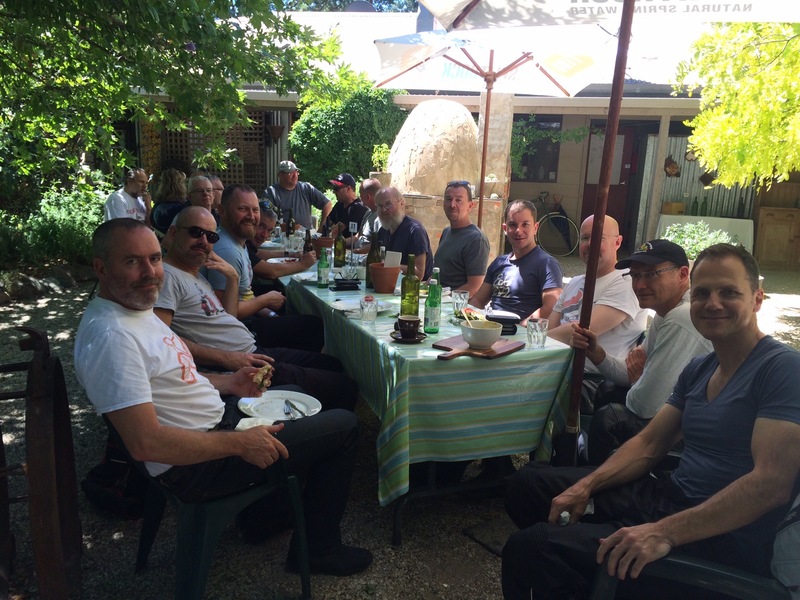 Dewy met us at lunch after missing the start of the ride due to a flat battery on the Ducati, and Doug & Dean arrived as well from Euroa. 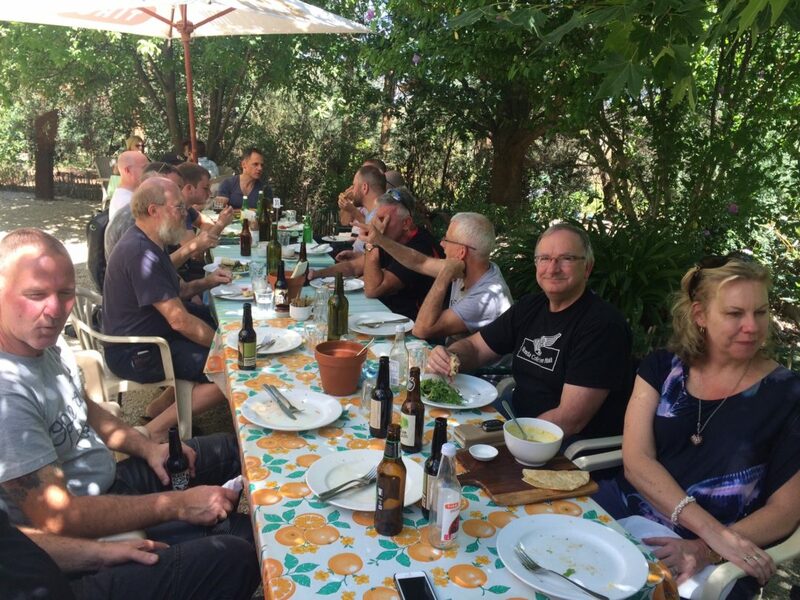 Doug has recovered well after his accident last year, and is very keen to get back on the bike and join us on a club ride sometime soon. As the waitress started bringing the food to our table she turned to me and said “Oh my god it’s your group here today”. It was Jen who with her partner Peter Moore who use to own and run the Royal Mail Hotel where the club currently meets. It was great to see her again and she was so pleased to see us. After a relaxing lunch it was time to get moving again as the day was staring to get late. We headed out of Ruffy and turned off towards Highlands and Gin Gin. The roads on this section are narrow and twisting as we pass through farms and vineyards on the high plains before descending down the mountain range and back through river flat country and into the town of Yea. A brief regrouping on the highway before Yea, and a farewell to a few riders heading back east and home before the rest of us turned off towards Flowerdale and Kinglake before arriving at the end destination, Whittlesea. This is a really lovely section of road for motorcyclists, but unfortunately has been wrecked by the nanny state putting an 80kmh limit on the entire length. By the time the first few riders arrived in Whittlesea it was really getting hot. We bought drinks and waited for the rest of the club to show up so we could say our goodbyes and head home. After some time I received a call from Rob saying Dewy had run out of fuel (has to be a Ducati thing) and they managed to borrow someone’s hose to syphon fuel from one bike into another. Finally everyone was together at the finishing point of the ride and we all said farewells as the the main group headed home back to Melbourne, and I just turned around and did it all again going back to Marysville.